When Gemma Brooker came upon Philip Marriage‘s 1967 photograph of the corner of Gun St published in these pages, she was astonished to recognise the cafe ran by her grandmother where her parents had worked and where she spent many hours as a young child, but which she had not seen since 1948 when she was nine years old. 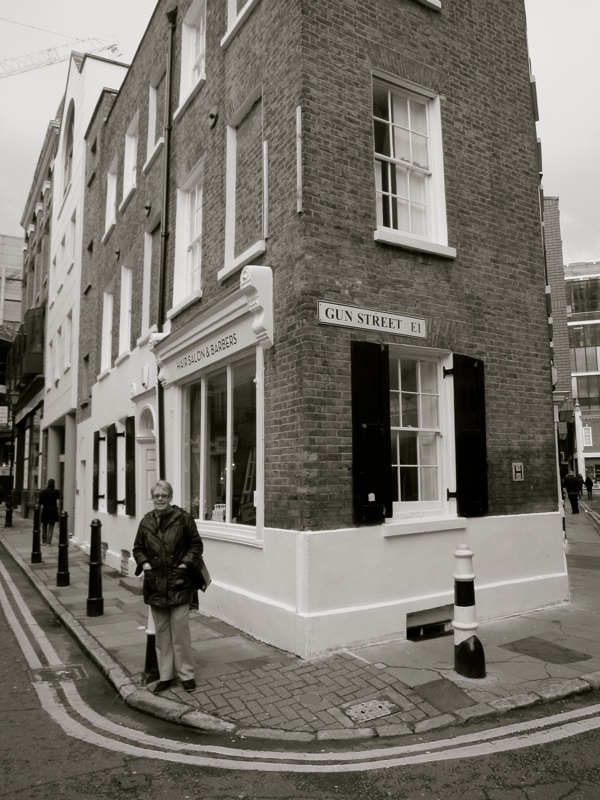 Last week, she came back to Spitalfields to take a look around and I photographed her standing outside Verdes, where her grandmother had lived in the first floor flat, and looking across Gun St to the opposite street corner where the family cafe once stood. 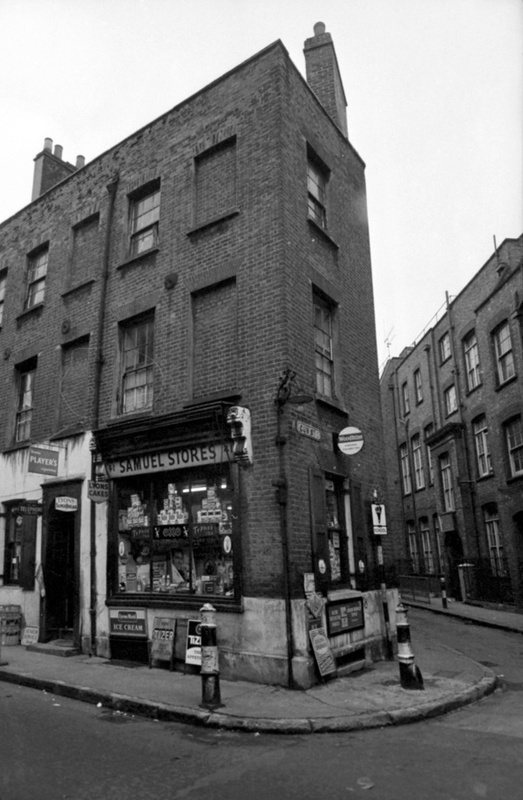 The old iron bollard is the only visual clue which links the two photographs yet, upon her return more than sixty years later, Gemma found the fifty-yard stretch of Gun St that was the demarcation of her childhood landscape still evoked vivid emotional memories of her early formative years in Spitalfields. Verdes has been restored but, although the opposite corner has been entirely rebuilt, Gemma was fascinated to observe that the falafel shop upon the site today has adopted the same layout as her grandmother’s cafe. Similarly, as we wandered down Gun St, Gemma pointed out the doorstep where – in her memory – an old Jewish woman always sat plucking chickens and, even where the buildings had been replaced, she was able to recall the stories of the former landmarks that once stood there. 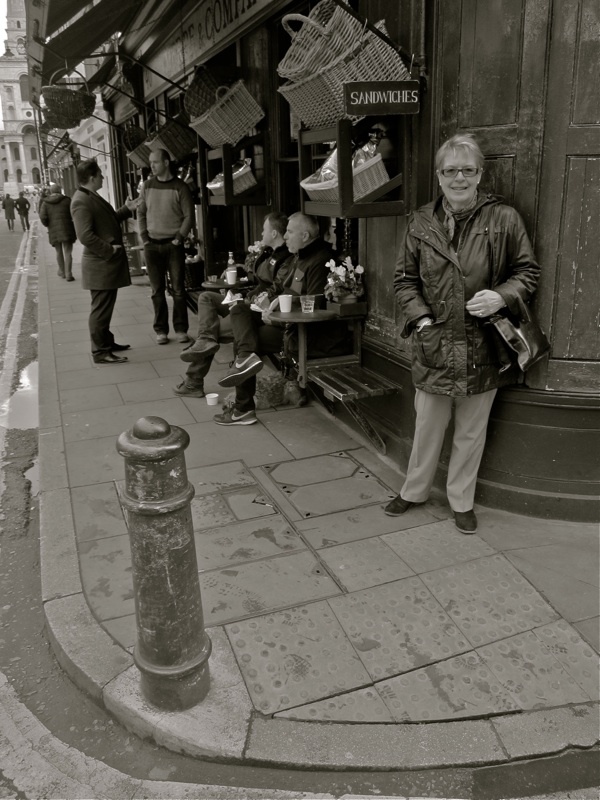 At the end of Gun St, Gemma was overjoyed to discover her childhood sweet shop and I found, as we walked together and she told me the stories, her childhood vision of this tiny corner of Spitalfields in the nineteen-forties came alive for me too. 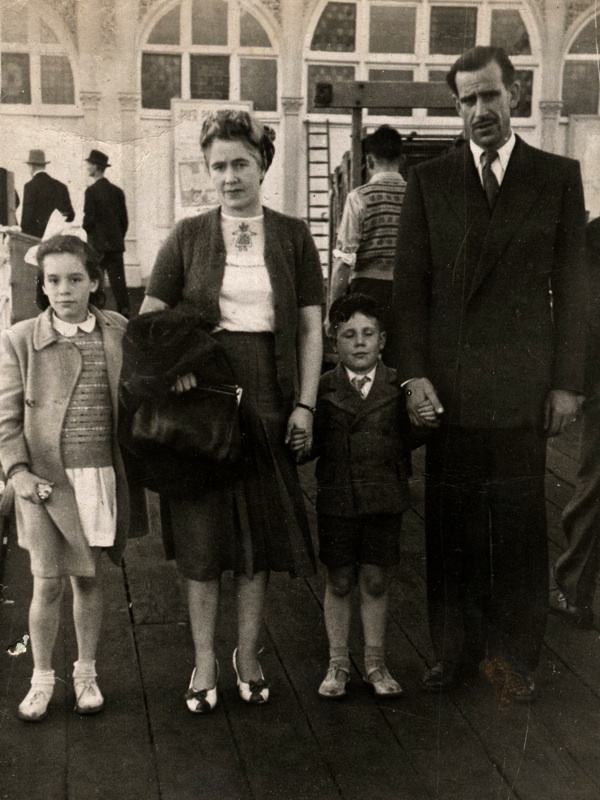 “My father Giovanni Batista Giovannoni was born in Leather Lane, but his parents came over from Italy. 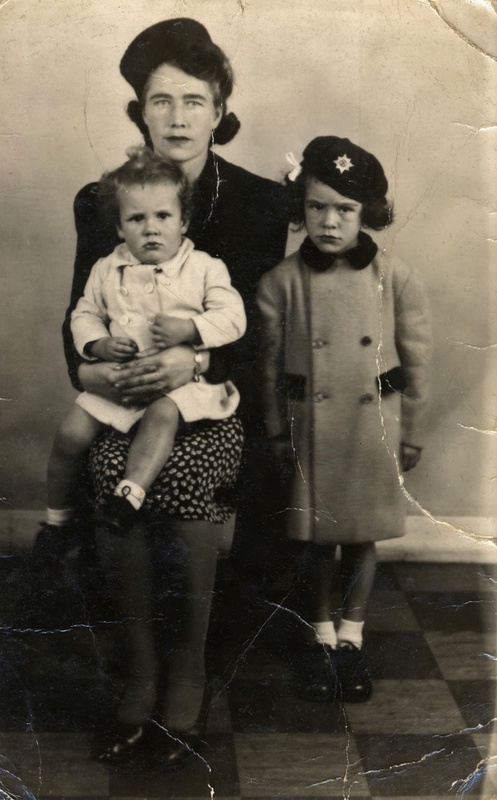 My grandmother Gemma came from Piazza al Sercio near Lucca and he came from another village nearby. I was born in University College Hospital in 1939 when my father Fernando Albano Giovannoni was away in the services. We were sent all over the place during the war, including Scotland. It was only afterwards that we came to Spitalfields where my parents worked in my grandmother’s cafe. I don’t know why it was called C J Johnson, except that my grandfather’s name means “little John” and my uncle also adopted the surname Johnson when he joined the RAF in World War II because his Italian surname was embarrassing. 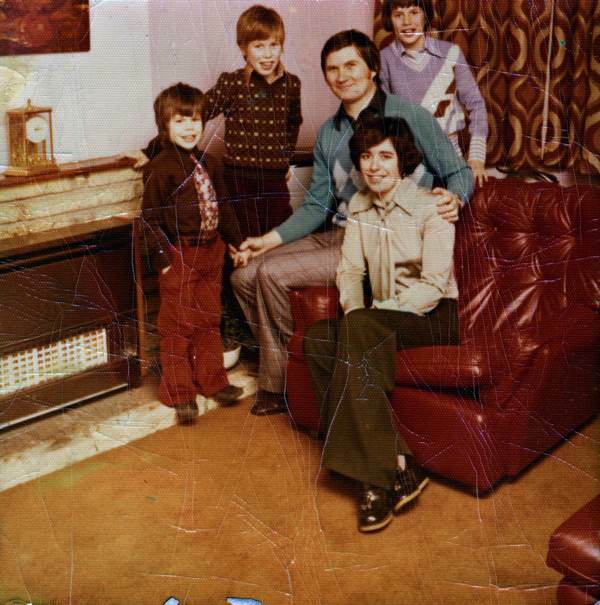 We lived in the Hackney Rd and a van came to pick us all at five in the morning to take us to the cafe. While my mother was working, my grandmother used to babysit me and she wanted to pierce my ears and teach me Italian, but my mother wouldn’t allow her because she was Irish – but I wish I could speak Italian now! My mother was called Mary Ann Maher and she came over from Tipperary when she was fourteen. The cafe opened at five in the morning and closed around midday. There was a counter in the centre at the back and a cupboard in the wall on the right ,where the old men used to line up to use the illegal one-arm bandit that was concealed inside. It was always very busy with workers from the market and I remember the men with their newspapers picking out racehorses. I used to sit with them until it was time for me to go to my school in Gun St. I loved going to the cafe and seeing all the people. In Gun St, between the cafe and my school, there was a warehouse where a boy called Albert worked packing boxes and I used to go and speak with him on the way to school. I was in love with him. The school was run by nuns, it was a Catholic school. We used to play in the cellar of the school at break time. It was massive, they had toys down there and chairs. My parents only allowed me to go as far as the paper bag shop in Gun St run by Mrs Bloch and her son Natey, they used to let me go upstairs and play on the piano. I think we had an aunt in Artillery Lane who also worked in the cafe too and we used to go there at Christmas. 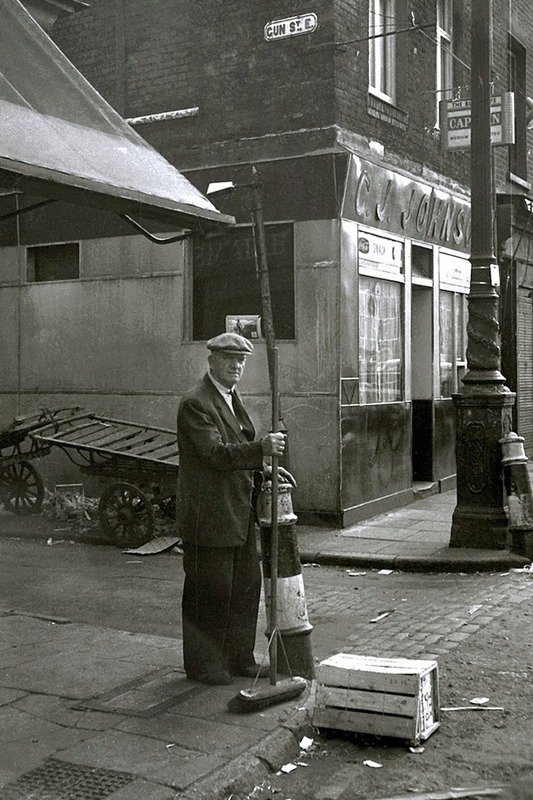 I never went into the Spitalfields Market because there all these men running around with barrows and it was dangerous to cross Brushfield St.
One more moving lifetime story. — Childhood places remain ever-present! How lovely to read about childhood memories. I can picture the ladies plucking their chickens on the steps. The family photos really bring it to life. I love Gemma’s stern expression in the first family photo. I was just browsing this site looking at old buildings when I stumbled across this page.Just a year ago I had to get a copy of my birth certificate and found that I was born at No 52 Gun St.I thought I was born in London Hospital.I don’t have many memories of Gun St though as we moved when I was 4 years old.I definitely remember my older sister taking me to the sweet shop though.I was born in 1953. My memories of Gun Street are not good ones! I was born in 1954. There were five of us kids, my mum and step-dad and we lived in the hostel for a few months, although I dont think my stepdad was allowed to stay there with us. Think this might have been Providence Row? Not sure it had a name, I was about 9 at the time. I remember it being a drab, miserable, cold place…the first “flat” we had I remember as consisting of 2 rooms, one was a bedroom where we kids slept in the same bed and the other was, I presume, the living area. The bathroom area was at the top and was communal as was the kitchen. At night if you wanted to spend a penny you had to climb the freezing concrete steps up and hoped nothing would run over your feet! We eventually “upgraded” and went further up the building where we had a three roomed “flat”, of which one room led onto to the fire escape, which eventually was to be our escape route! While we were living there I had the “pleasure” of attending the catholic school attached to the hostel, there was a doorway from inside the hostel to the school but we were not allowed to use it, had to go out the hostel and then back in to the school. I hated my time at the hostel and at the school, my family were not catholics, so found school miserable. Thankfully, we escaped but I was left with a lifelong nervous disposition.